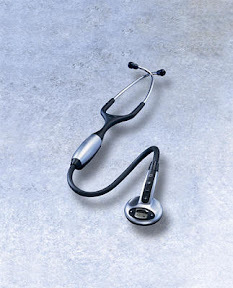 Every now and again I see someone who is interested in buying an electronic stethoscope. I think it's great for people with hearing impediments. But I think it should stop there. If you keep going, then what is the difference between a stethoscope and a portable ultrasound or echo machine? Patient: "Hi, I'm booked for a Stethoscopy?" Receptionist: "Yes, Mr Patient. Please take a seat. The Cardiologist will be with you soon." Cardiologist: "Hi, Mr Patient. Please come in, and remove your shirt. Today we'll be doing an auscultation." Patient: "That's a fancy piece of equipment there, doctor." Cardiologist: "Yes, it's worth a fortune and has revolutionised how we charge, um, I mean, examine patients these days." Cardiologist: "Thanks Mr Patient, that's the end of the auscultatory investigation. We'll analyse your heart sounds on the computer this evening and send the report to your GP." Receptionist: "That will be $150 Mr Patient. Please sign this form and Medicare will reimburse you... um, nothing." Cardiologist (in his office): "Mwaa ha ha ha ha ha ha! Just to think that would take 2 minutes with a regular stethoscope and I'd be making nothing on it! God thank the genius who turned auscultation into a separate complex investigation! Mwaa ha ha ha ha ha!" This article in Academic Medicine recently caught my eye, observing that US medical students have a declining level of empathy for their patients during the course of their studies. Is There Hardening of the Heart During Medical School? Academic Medicine. 83(3):244-249, March 2008. Purpose: To determine whether vicarious empathy (i.e., to have a visceral empathic response, versus role-playing empathy) decreases, and whether students choosing specialties with greater patient contact maintain vicarious empathy better than do students choosing specialties with less patient contact. Method: The Balanced Emotional Empathy Scale was administered at the beginning of each academic year at the University of Arkansas for Medical Sciences for four classes, 2001-2004. Students also reported their gender and specialty choice. Specialty choice was classified as core (internal medicine, family medicine, obstetrics-gynecology, pediatrics, and psychiatry) or noncore (all other specialties). Results: Vicarious empathy significantly decreased during medical education (P < .001), especially after the first and third years. Students choosing core careers had higher empathy than did those choosing noncore careers. Men choosing core careers initially had empathy exceeding population norms, but their empathy fell to be comparable with that of norms by the end of their third year. The empathy of men choosing noncore careers was comparable with that of norms. Women choosing core careers had empathy scores comparable with those of norms, but the scores of women choosing noncore careers fell below those of the norms by their second year. Conclusions: The findings suggest that undergraduate medical education may be a major determinant differentially affecting the vicarious empathy of students on the basis of gender and/or specialty choice. The greatest impact occurred in men who chose noncore specialties. The significant decrease in vicarious empathy is of concern, because empathy is crucial for a successful physician-patient relationship. "Vicarious empathy" is the empathic response you can't control, the "gut feeling". "Imaginative empathy" is something that can be acquired - "What if I were in their shoes?" The more empathic you were before you started medicine the more likely you would be empathic at the end. Everybody loses vicarious empathy during the course of their degree. If you chose to specialise into surgery pathology or radiology you were (likely to be) less empathic. I'm no rocket scientist, but I take issue with the belief that Vicarious Empathy is a good thing. Getting teary when discussing the risks of intraoperative death during elective surgery is not a good thing. Getting butterflies when a patient tells me about their grandchild with a congenital heard disorder distracts me from looking after the patient. But then again I'm a surgeon... who am I to comment?